What you saw: All of Ben and Courtney (mean-spirited model and exhibitionist) as they took a midnight skinny dip, and not enough of the beautiful beaches of Vieques, an island located eight miles off of Puerto Rico’s southeast coast; Old San Juan (a 20-minute helicopter ride away on the main island of Puerto Rico) on Ben and Nikki’s rain-soaked date; Roberto Clemente Stadium in San Juan on the group baseball date; the two-year-old W Retreat & Spa – Vieques, the chicly designed 157-room beachfront resort (shown at right) where the ladies and Ben stayed, spa-ed, and dined on cuisine from Alain Ducasse’s miX on the Beach, from $389/night. What you didn’t see: The most famous attraction on Vieques, the bioluminescent bay, where when the moon wanes, you can kayak out onto the bay where phosphorescent organisms in the water glow all around you; the island’s many pristine beaches, such as Sun Bay Beach, Blue Beach, and Green Beach. 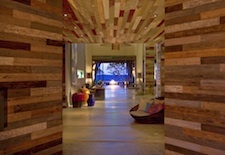 Bachelor-inspired package: The W Retreat & Spa – Vieques is offering two packages. The first includes daily breakfast for two at miX on the Beach, dinner for two at miX on the Beach, a one-day Jeep rental with a packed picnic basket, and a couples massage with a sunset Jacuzzi experience, from $590/night with a three-night minimum. 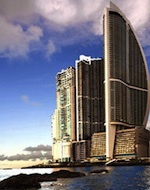 The second incorporates elements directly from the show and includes four nights in a WOW Suite, daily breakfast at miX on the Beach, a private dinner date at Paradise Edge, a one-day cabana rental with a bottle of rosé wine and fresh tapas, a one-day Jeep rental with a packed picnic basket, and a couples massage with a sunset Jacuzzi experience, from $1,260/night with a four-night minimum stay. What you saw: On the group date, Ben and the ladies cruise down the Chagres River to visit a local tribal village – where Courtney once again proves she’s not shy by donning a skimpy beaded tribal top without her bikini underneath; the beautiful and secluded San Blas islands, where Ben and Kacie have their castaway “survival” date; and the Trump Ocean Club International Hotel & Tower in Panama City, an architecturally striking (it resembles a sail, shown at left) 70-story tower on the city’s Punta Pacifica peninsula featuring 369 spacious and contemporary rooms and suites with private balconies, as well as a 13th-floor deck with five pools, from $239/night. What you didn’t see: Although the Chagres River cruise showed a bit of Panama’s lush rainforest, there’s plenty more nature to enjoy as the trees and landscape are filled with monkeys, sloths, and more tropical birds than you can imagine; the engineering marvel that is the Panama Canal, as this series of locks and lakes link the Atlantic and Pacific oceans for almost 50 miles and provide transit for as many as 14,000 ships a year. Bachelor-inspired package: You can enter to win a four-night “Discover Panama” Grand Prize in The Bachelor Ultimate Getaway Sweepstakes, which includes airfare for two to Panama City, four nights in an Executive Suite at Trump Ocean Club, and daily breakfast. Enter daily until 11:59pm on March 19, 2012. 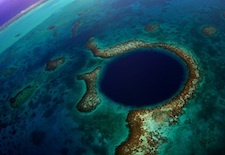 What you saw: The offshore island of Ambergris Caye, where Ben stayed at Coco Beach Resort, featuring hotel rooms, one- and two-bedroom villas and casitas with Belizean wood accents and Balinese furniture, as well as two free-form pools, from $271/night; the Blue Hole, a famous dive spot, where Ben and Lindzi jumped from a helicopter into the sapphire-blue water (shown at right); Caye Caulker, a small islet where Ben and Emily rode bikes (there are only bicycles and golf carts on the island) and hunted for lobster before enjoying cocktails at the Lazy Lizard Bar and Grill; Lamanai, the famed Mayan ruins in Northern Belize where Ben and Courtney climbed to the top and played with a tarantula; Victoria House, the elegant and romantic 42-room Ambergris Caye resort where Ben and Courtney had a torch-lit dinner, from $185/night; Ben, Kacie, Nikki and Rachel snorkeling with sharks; and Rojo Lounge, the Ambergris Caye night spot where the rose ceremony took place. What you didn't see: Belize is also home to several other Mayan ruins (such as Caracol and Xunantunich) as well as an intricate network of caves (the standout being Actun Tunichil Muknal, home to the intact skeletal remains of sacrificed young Mayan woman known as the Crystal Maiden because her calcified bones sparkle); and the third largest reef on the planet, which attracts divers from all over the world. 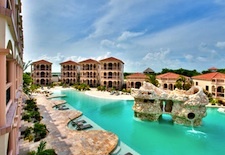 Bachelor-inspired package: Coco Beach Resort on Ambergris Caye (shown at left) is offering “The Bachelor Island Romance Package,” which includes four nights’ accommodation, daily breakfast, chilled bottle of champagne, one-hour couples massage, three-course candlelit dinner on the beach, sunset cruise, and more, from $1,399 per person. The Belize Tourism website also features 10 romance-themed packages. You can also enter to win the eight-night “Belize Grand Prize” in The Bachelor Ultimate Getaway Sweepstakes, which includes five nights at Victoria House and three nights at Coco Beach Resort, both located on beautiful Ambergris Caye. Enter daily until 11:59pm on March 19, 2012. See our Puerto Rico, Panama, and Belize destination guides for more trip-planning information, then use our Travel Search price comparison tool to find the lowest rate on flights, hotels, packages and more travel deals.